John Shelor's Flathead Ford Engine Experience. John has many decades of knowledge and experience with antique Ford Motor Company cars and trucks. I have identified at least 32 brand names of 1932 to 1938 Ford V8 flanged rod bearings. Weighing 10 pair of rod bearings on a postal scale, I have observed weights ranging from 177g to 211g. To achieve perfect engine balance, all parts that rotate or reciprocate must weigh the same as similar parts (e.g. pistons, connecting rods, rod bearings). My arbitrary standard is that any pair of bearings should weigh within one gram of the other pairs in a given engine. One gram = 1/28.35 oz. One other preference of mine is not to run uncoated bronze bearings on the steel shaft because the old timers say it will be harsh to the crankshaft. You are currently on our blog. 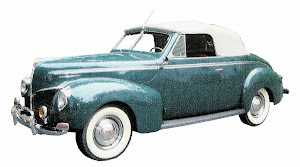 Click this link to return to the main Classic Parts 4 Cars website. How Does An Auto Engine Distributor Work?